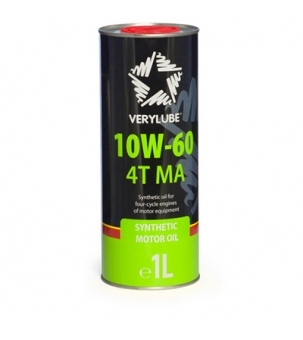 High-quality synthetic motor oil for four-stroke engines of motor equipment. Specially developed for engines of motorcycles operated at maximum speeds. Effective for powerful high-speed engines of sports motorcycles and all-terrain vehicles. Due to the special highly viscous formula, creates a very solid oil film and withstands extreme dynamic loads occurring in motor sport. Effective by prolonged thermal overloads and limit speeds. Notable for extremely low oil burning losses due to minimal evaporation. Provides especially smooth gear shifting and stable coupling of parts in the oil bath. Corrects compression and increases the engine capacity.